The Love of my Life. (I was going to type that in Hawaiian, but Google translate totally doesn't have a Hawaiian option...get with the program Google!) I aloha him. Last week, a very special envelope arrived in our mailbox. In it were four very special cards--one for each member of my family (except me). So, before I tell you about the cards, did you know that The Maestro is part Hawaiian? Well, despite his inability to do the hula, he is. His father is half Hawaiian and his Tutu (grandmother) had full Hawaiian blood. These days, that is very rare. So rare, in fact, that the island powers that be are assembling a registry of those who are "descended from the aboriginal peoples inhabiting the Hawaiian Islands." Joel, being the avid genealogist that he is, was all over this project when he read about it. He gathered all of the necessary documentation and sent it in, and a week later, our very special envelope arrived. The girls were THRILLED. I love that they love this part of their heritage. 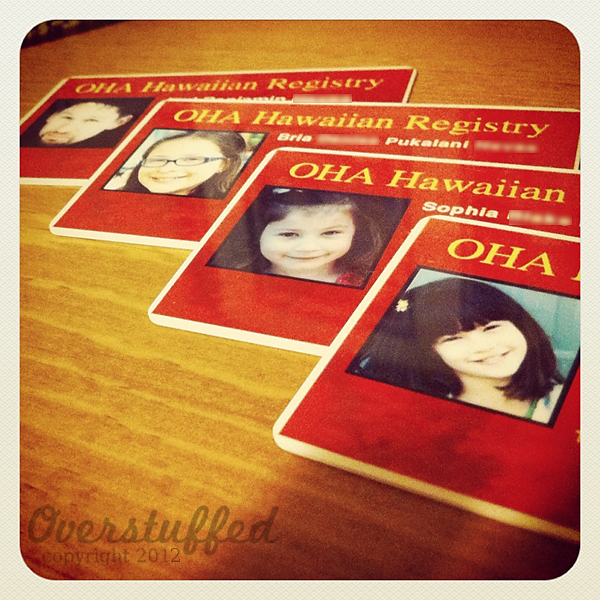 They love their Hawaiian names and they love to learn about their Hawaiian ancestors. "Everyone in my family is Hawaiian exept my Mom." Talk about feeling left out! No worries though. I married the Hawaiian because I love him, not because he's Hawaiian. Good thing, too, because if I married him for any islander perks, I would be sorely disappointed to find myself trading the sand castles of Maui beaches for the snow sculptures here in snowy Michigan. They do say it's God's country here, but I'm not so sure the Hawaiians would agree. Awesome! How fun for them! And you are awesome via marriage. :) Those snow sculptures are beautiful! I had no idea that those bloodlones were rare. Very cool!! Funny - they call Idaho "God's country" also. I guess it's all his! I didn't know there was Hawaiian blood in your family. I think that's really cool that you gave your girls Hawaiian middle names. And they are so beautiful! What a cool thing to have that unique heritage that is being preserved right now, as well! I cannot tell you how you've impressed me, Lara, with the fluentness of your Hawaiian. You aloha your husband? I would never have guessed you weren't a native like the rest of your family! Well that is pretty darn cool! How fun! I will have to tell my girlfriend about this- her Husband is half Hawaiian. Oh- and my neighbor is full Hawaiian! I'll tell her too! I love that Joel followed up on this. Not that it surprised me one bit. And we fully claim you, my Hawaiian Sister! Catching up and before I say anything about the Hawaiian lineage, I have to say, I loved the post about the dear thing that I write in! I could see your frantic family getting the house all cleaned and ready only to get the call that you wouldn't have a house guest after all. Isn't that how it goes? My grandfather jumped through all the hoops needed to get his grandchildren registered as Cherokees. I have the little card, but this reminded me I should get on registering my kids, too. It is part of our heritage, even if we don't exactly look the part. So happy they're excited. What a cool snow sculpture!